In our school, the elementary students pretty much run the place. They have all sorts of responsibilities that go well beyond the typical school curriculum. One of their jobs is to collect, wash, fold and deliver laundry to the rest of the classrooms. At first glance, this may seem like just another chore, but nothing in Montessori is busy work and doing laundry is no different. Everything here carries its own lessons and you won’t believe all that the children learn from this one simple job. So why laundry? 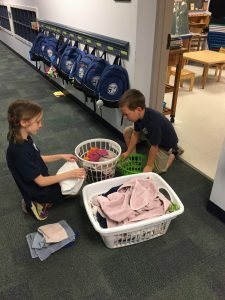 Aside from the necessity of the job, the experience of doing laundry for the whole school holds importance for everyone. Most children enjoy managing the laundry and all that it entails. Other children might find this job tedious or difficult when their turn comes around. For the former, all the learning they get from the experience brings enjoyment too. For the latter, doing laundry represents an opportunity to complete work they didn’t want to do in the first place. I think we often underestimate this accomplishment in children. Learning to persevere through an undesired task is a life skill that will be needed again and again. The act of collecting, washing, drying, sorting, folding and delivering the laundry involves numerous direct and in-direct lessons to be learned. Obviously, doing laundry is, itself, a lesson. But just the act of starting and finishing a somewhat complex, multi-step process is a task with which many children struggle. Following a sequence and remembering to complete each step requires patience, foresight and concentration. Seeing one’s work through to completion is something that cannot be done frequently enough. The physical aspects of the job are also beneficial as the child is constantly moving -through collecting the laundry, loading and unloading the washer/dryer, folding, stacking and delivering it again. Use of the hands -what Dr. Montessori called “the prehensile tools of the mind” is crucial for children. Folding, in particular, helps to refine the pincer grip -which is used for writing. Time management is also a factor, as children learn how to integrate laundry duty into their weekly work plans. Doing laundry is also a collaborative effort involving two children. Communicating, delegating, even problem solving all come into play. Depending upon the cooperative skills of each child, this could make things easier or more difficult. In either case, both children learn the dynamics of team work. Once completed, the experience is empowering for the child. They get an immediate sense of accomplishment. More than completing a test or research paper, doing laundry is a project. Project-based work is a much more accurate representation of what they will find in their future careers than test-taking. At MAB your child will learn skills that will stick with them forever. That’s another important distinction between purposeful work and rote memorization or regurgitation for tests. In the case of laundry, applying what they have learned creates a lasting connection with the ideas. It is a step toward mastery. Conversely, cramming for a test may yield a good grade, but most of the information covered will be lost within weeks. The students have been doing laundry at our school for nearly 15 years. So it seems natural to us. Each time I observe it, I am reminded of its value. Even though the concept seems so foreign to our traditional education system, I believe doing laundry is a perfect example of the work that our children should be doing every day.